For Jamie Clark, it all happened very suddenly. Returning home from a day of work, Jamie discovered that the national radio talk show, The Elvis Duran show, had discovered her small home-based subscription box business, The Willie Wags, on Instagram. Duran purchased boxes for all the women in his office, and even mentioned the boxes, which feature hand-tested products created by female entrepreneurs ranging from jewelry and books to body products and more, on his show. “It just kind of exploded. In the span of two hours it went from a fun little hobby to ‘what am I going to do now?’” Clark laughed. After this national exposure, Clark realized her part-time hobby could turn into a full-time opportunity of a lifetime. But she couldn’t do it alone. Since then, Clark and business partner Ashleigh Bachand have expanded the Willie Wags brand to include a storefront in downtown Bangor, a magazine that ships with each box and popular after-hours events. But behind the growing small business is something simple: A celebration of female entrepreneurship and empowerment that had pretty humble beginnings. When Clark first launched The Willie Wags as a subscription box in January 2016, it was a so-called side hustle — something to do when she wasn’t working at her full time job — that she ran out of her basement. “Initially I thought that I could do The Willie Wags part time, and help my husband with the other business. But very quickly it was exploding online and suddenly it was a ‘I’ve got my feet in two canoes and they are going downstream, and I have to pick one’ situation,” Clark said. The other business is the restaurant-slash-convenient store in Levant, 20 minutes out of Bangor, that Clark and her husband opened a decade ago. As Willie Wags took off, she found that juggling two businesses can be challenging. Ultimately, she chose Willie Wags. Bangor Director of Community and Economic Development Tanya Emery worked closely with Clark as she developed The Willie Wags into a downtown brick-and-mortar destination. Emery stresses the importance of new and revolutionary retail coming to Bangor. The downtown store is a bright pop of color with a warm inviting atmosphere. A pull away door opens to an entrance to the neighboring coffee shop. A wall has been dedicated to public engagement by offering a place to write and stick positive notes in bright primary colors. Small info cards highlighting the background stories and inspiring journeys of the female entrepreneurs are placed next to the corresponding products. A large leather couch sits in the center of the store, accented by colorful pillows and surrounded by a patterned rug — inviting visitors to put their feet up and relax while shopping or having a friendly conversation. Conversations are something of high importance to Clark and Bachand, both inside the store and beyond. On their Facebook page, Bachand writes a weekly post called Founder Feature Fridays in which she highlights a female entrepreneur and her products that The Willie Wags carries. A recent post featured Maine native Kate McAleer of Bixby & Co., who creates clean, natural chocolate. The post, accompanied by colorful photos of the snack food, mentioned Kate’s inspiration. The mission of sharing the stories of the women behind the products they carry goes beyond the store and social media. Clark and Bachand tried a few methods of making sure their subscribers knew the stories behind each of the products they were being sent starting with “one pagers” placed in all the boxes. They also tried tying individual rolled up papers to each item. But eventually they landed on Wicked Magazine, which they produce monthly. Both women also write small segments for the magazine that focus on the theme of each month’s box. For instance, the February 2018 issue had a note with tips and tricks for family vacations from Clark on the third page, following an framable inspirational quote. Bachand feels at home in her role as Chief Operating Officer at The Willie Wags, where she acts as Clark’s “right-hand-gal.” Bachand assists in product acquisition, marketing, sales, managing the stores employees and anything else that Clark may need help with from week to week. The pair met through Chloe and Isabel, a jewelry company where Bachand worked as a regional merchandise manager. She was in charge of recruiting and managing a team of other merchandisers, and reached out to Clark without an answer initially. Eventually Clark did answer and when the two finally met, they immediately hit it off. They became fast friends, and talked over phone, text or messenger almost daily. When Clark first approached Bachand about her idea of The Willie Wags, she was immediately on board. The duo has created a successful, unique business that fits right in with the current national movement of women supporting women. And the impact of The Willie Wags on women-run businesses is getting noticed. The Willie Wags was listed in the top 10 finalists for the InnovateHER Business Challenge for Innovations that Empower Women’s Lives in October of 2017. The competition held in Washington D.C., looks for entrepreneurs who demonstrate innovation and talent with a unique product, service, or technology that impacts the lives of women and families. 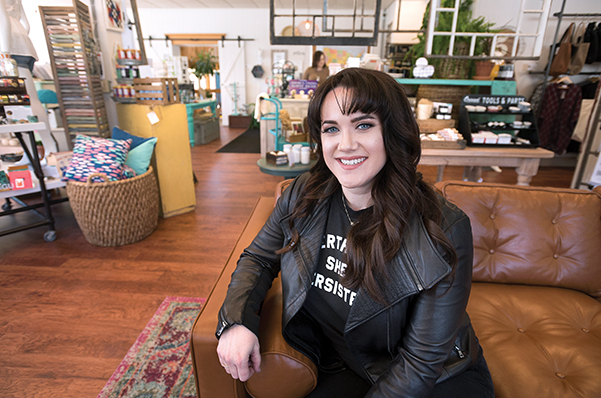 Clark envisions her store helping other female entrepreneurs like her, who are starting out with the passion, the diligence, and the fearlessness needed to make a business. The newest addition to The Willie Wags is their after hours events. In an attempt to constantly expand the brand beyond just the store and the subscription boxes, Clark and Bachand created events for women to get out of the house to connect with and support other women. Some of their events include salsa nights, plant and sips, book signings, and business workshops, all geared towards empowering women and creating relationships.